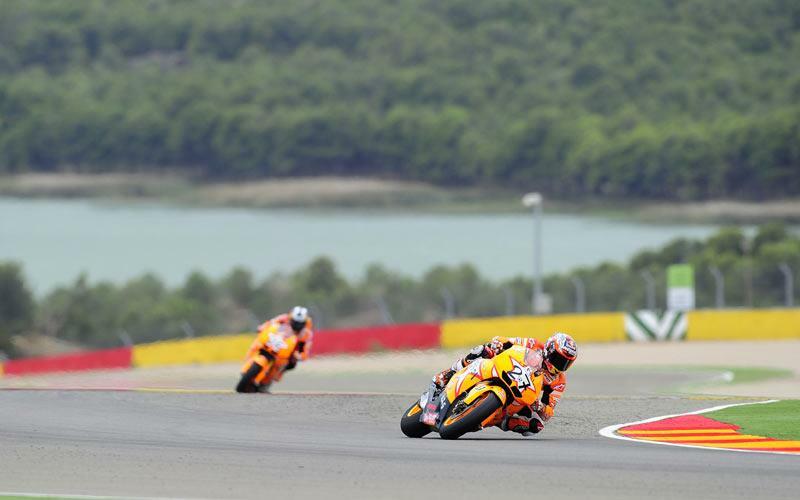 Casey Stoner praised Repsol Honda team-mate Dani Pedrosa’s development skills after he continued his relentless charge to the 2011 MotoGP world title at the Motorland Aragon track yesterday (Sunday). The Australian dominated the 23-lap encounter to win for the eighth time this season in another processional MotoGP race. And the 25-year-old, who has now won 31 races to equal the number of wins recorded by American legend Eddie Lawson, said his startling success in 2011 had been helped by the development work carried out by Spanish team-mate Pedrosa on the RC212V. Stoner, who has already won more than half the victories claimed by Pedrosa in six years at HRC, said: “I respect Dani a lot as a racer and the work that he did with this bike is evident. I only rode it last year so I only change a few settings. This is why I also wanted his opinion with the 1000. Stoner’s latest triumph moved him 44-points clear of closest title rival Jorge Lorenzo with just four races remaining. The next race is at the Twin Ring Motegi in Japan where Stoner won on the Ducati GP10 last season. The Japanese round is followed by his home race at Phillip Island, where Stoner has never been beaten in the 800cc era. He is an overwhelming favourite to clinch the title for the second time and he said: “It is a really healthy situation at this moment but anything can happen and Jorge is there week in and week out. If I make any mistakes he will pounce, so we’ve got to make sure we don’t make any mistakes. Assessing his prospects ahead of the Japanese Grand Prix, Stoner added: “It is somewhere I’ve always done reasonably well at and it is very challenging with a lot of braking and acceleration points. It is pretty important to have a good bike on the brakes and good for acceleration. For seven pages on the Motorland Aragon race and all the latest news from the BSB and WSB paddock, see the September 21 issue of MCN.